In Part I of the Ultimate RV Road Trip on a Budget, we took you on a scenic tour along the east coast. In Part II, we’ll create a west coast trip that spans several states. To prep for the trip, you’ll want to de-winterize your RV and buy any parts you may need in the process. After all, America’s west coast is full of possibility and adventure-so why not start planning and prepping early. Starting in Washington and ending in Arizona, the trip is laid out across 5 states. Zigzagging down the west coast with plenty of excursions, you can start or stop the trip anywhere you’d like. We’ve highlighted some of the best of the west, as well some less popular attractions to give you a unique travel experience. Expenses for the trip were kept at a minimum, with the budget friendly traveler in mind. Don’t see a place you’d like to visit? No problem. Use the list as more of a tweakable starting guide for ideas in your trip research. Edit our trip to your hearts content to create the perfect west coast trip for you. This trip is great for those seeking the best of the outdoors and the city. Whether it’s a family vacation, a road-trip with your pals or a retirement get-away, our west coast RV trip has something for everyone! Image courtesy of Jerry Meaden. Licensed under Creative Commons 2.0. Chock-full of Seattle’s best bites and crafts, Pike Place Market is one of the oldest farmer’s markets in the country. From fresh produce to artisanal sandwiches, the public market has something for everyone! Check out their website for more information on upcoming events and promotions to help plan your visit. 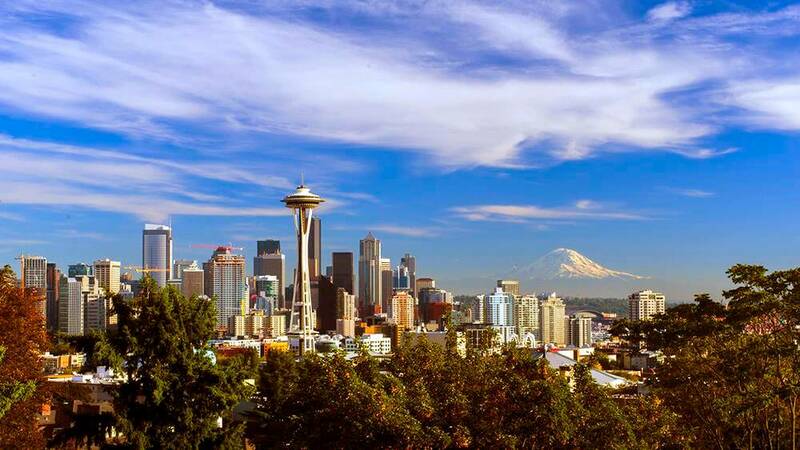 View the city from a more scenic perspective, on the deep blue water of Puget Sound! Ballard Kayak’s family friendly, 2-hour Puget Sound tour is both family friendly and educational. Learn about the ecosystem of the sound while viewing local wildlife like sea lions, herons and more! As an alternative, rent kayaks from Ballard for $25/hour per kayak and take your own personalized tour on the open water. Just minutes from the heart of the city with amenities like nature trails and fishing, Lake Pleasant RV Park is a natural oasis in the big city. Jump on nearby Interstate 405 or take the paved bike paths for easy access to your downtown adventures. Book early, as the sites tend to fill up quickly during the warmer months. Image courtesy of TravelingOtter. Licensed under Creative Commons 2.0. Hundreds flock to see this natural wonder every year. The rock was formed by lava flows long ago, along with many other coastal rock features in Oregon. 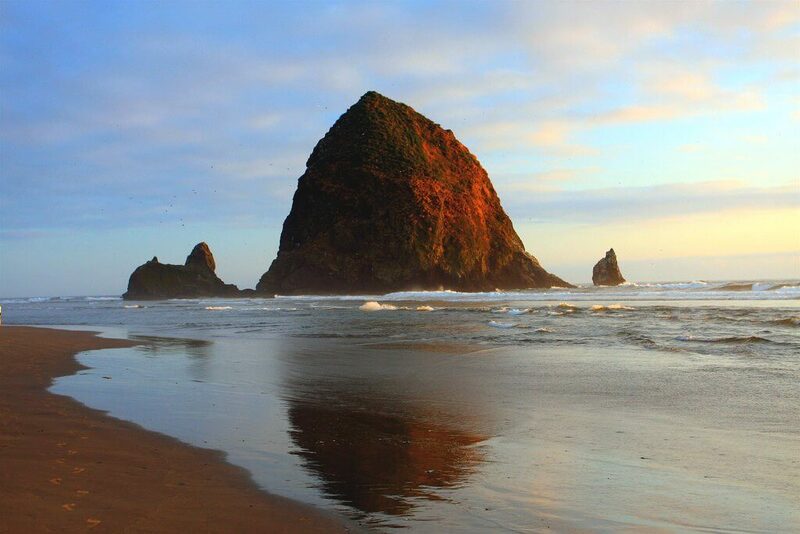 To reach Cannon Beach, park in the lots nearby on E Gower Ave or Nebesna St. and walk along the coast for a rewarding view. If parking is scarce at these locations, park at the large lot near Mo’s Restaurant and grab some clam chowder afterward! Goonies never say die! Keep the spirit alive and feel like a member of the gang on a tour of historic Astoria. Find hidden treasure and stay away from the Fratellis on the whirlwind tour around town featuring: The Goonies house*, East Basin Marina and Lower Colombia Bowl. Make a pit stop at the Oregon Film Museum to learn more about the filming of Goonies and other Oregon-shot films. For more festivities, plan your trip in conjunction with the annual Goonies Day on June 7! *Tip: View the house from afar while strolling along the Astoria Riverwalk. Located on the northernmost tip of Oregon, this park is just west of Astoria and a short drive north of Cannon Beach. With an on-site store and activities for the whole family, the Astoria / Warrenton / Seaside KOA park is not only fun but also convenient. Choose your preferred pull-in style, amp wattage and hookup method for the perfect stay! Haven’t had enough? Immerse yourself in history at the nearby Fort Stevens State Park and Lewis and Clark National Historic Park. Both parks are just minutes away! With over 300 miles of bike lanes, Portland was made to be toured by bike. Travel the low-traffic ‘bike boulevards’ with a group tour or on your own-it’s up to you! Pedal Bike Tours and Cycle Portland offer plenty of options for tours and bike rentals, including tandem bikes and kid’s bikes. Whether you’re renting a bike or you’ve brought your own, be sure to invest in a lock for each bike and read up on Portland Bike Etiquette. 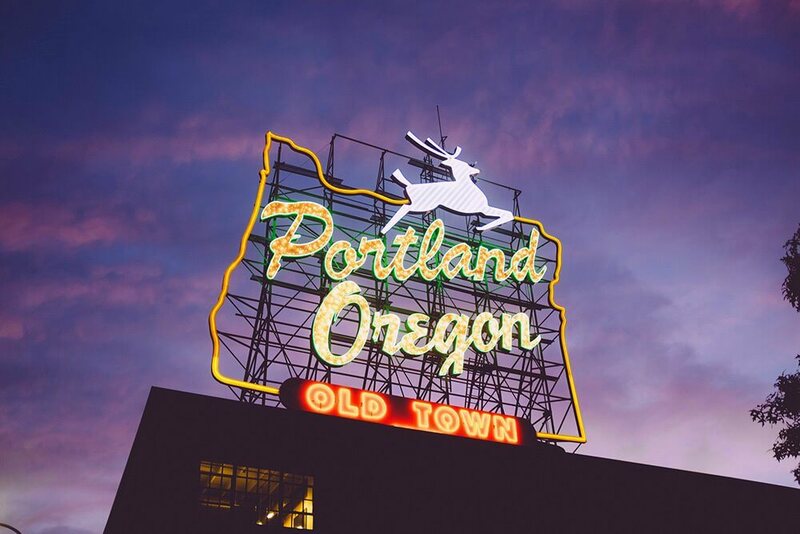 The Oregon Museum of Science and Industry, affectionately known as OMSI, boasts a wealth of activities fun for the whole family-especially the kids! Current exhibits include the Art of Brick, A View from Space, and Renewable Energy. Other activities include day camps, labs, a science playground, a planetarium, and USS Blueback-a working submarine you can sleep in! Less than 15 minutes from downtown Portland, the Columbia River RV Park is conveniently located within walking distance of local marinas, restaurants and stores. Free Wi-Fi is available for campers, as well as full hookup options. All sites are asphalt and animals are allowed! Image courtesy of Michael Balint. Licensed under Creative Commons 2.0. The iconic Avenue of the Giants is a location steeped in American history. 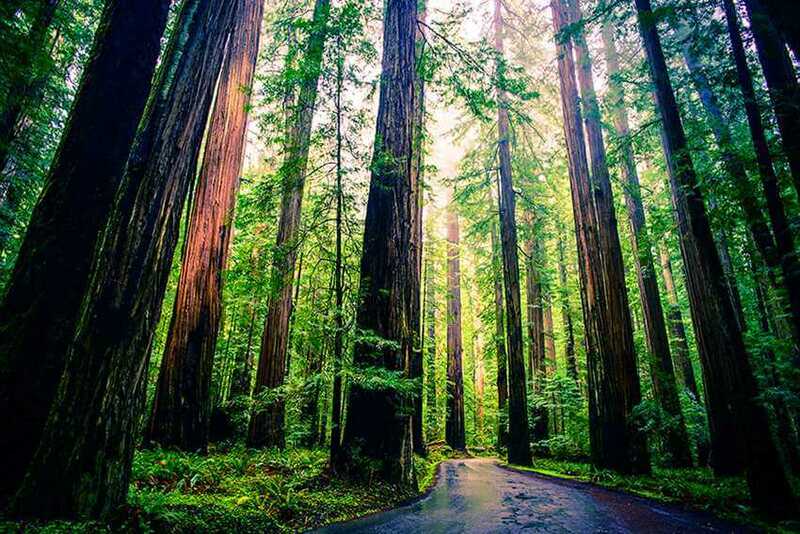 As mentioned in the patriotic song ‘This Land is Your Land’, the Redwood Forest is one of the prized natural wonders of America the Beautiful. Start your scenic drive at the North Entrance of the Avenue of the Giants. Stop halfway to learn more information about the beautiful park at the Visitor’s Center & Interpretive Association. Take a break for a picnic lunch at Williams Grove and drive or walk through the Shrine Drive-Thru Tree. End your tour at the South Entrance or proceed to Richardson Grove for more! View this map for more information. Instead of taking the beaten path, try this ranger recommended hike for great views of the Redwood Forest and the Pacific coast. The hike trails include: James Irvine Trail, Miner’s Ridge Trail and Gold Bluffs Beach Coastal Trail. The 13-mile loop can be tailored, depending on the length of hike you desire. This hike is great for all ages, with minimal incline and shade from the sun. View this guide, with an included map, for more information about the hike. Amidst the heart of the Avenue of the Giants, Giant Redwoods RV Camp Ground is the perfect headquarters for your Redwood Forest trip! Amenities include, but aren’t limited to: a volleyball net, a dog park, a food court, a swimming hole, horseshoe pits, and a playground. The park also provides plenty of privacy and peace, allowing you to truly connect with the great outdoors! You don’t have to go all the way to Italy to see an authentic, middle age Tuscan castle. You can enjoy Castle di Amorosa right here on the west coast! Enjoy sweeping views of Napa Valley, hanging out with castle farm animals and delicious wine. General admission includes roaming the splendid castle, as well as a wine tasting-with grape juice for the kids! For one low fee of $30, compared to $15-20 at each winery, the city of Napa allows you to enjoy plenty of wine. Rather than just sipping a couple bottles, you can enjoy plenty of tastings from various wineries in the area with a Napa Wine Tasting Card. If you prefer to taste at an actual winery, rather than a tasting room, don’t fret! Another alternative option, to the typically expensive tastings, is to get the Priority Wine Pass. The pass features a 2 for 1 tasting deal, so you and your significant other can taste wine for one low cost instead of two! The recommended wine tour with the pass is ‘Grape to Glass’ at Bell Wine Cellars, for superb taste and quality. Located in the northern end of Napa Valley, Castiloga RV Park is both scenic and relaxing. 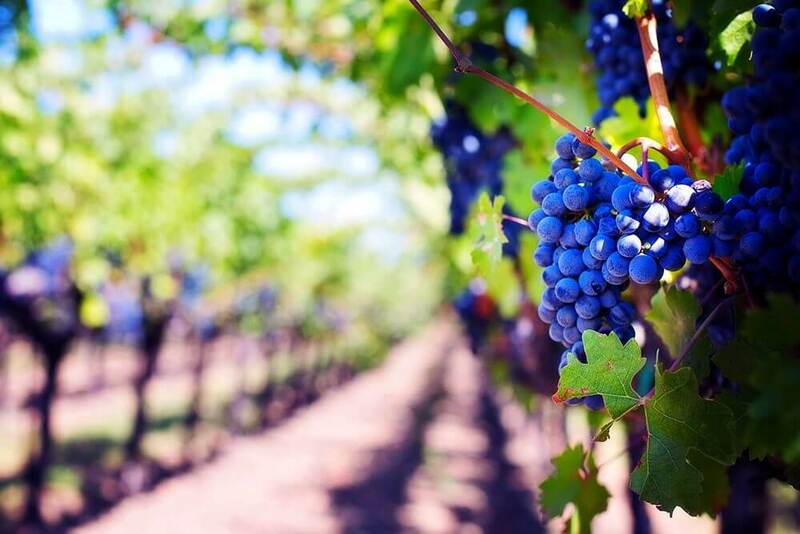 While the RV park may not be the cheapest on the list, due to its chief location in Napa Valley, it does have lower rates for standard sites. These sites include: water hookup, 30 amp electric and flush station access. The park boasts sweeping views of Mount St. Helena and the Palisades and easy access to shopping, spas and golfing. What better way to experience the 1.7-mile golden beauty, than to walk along it! 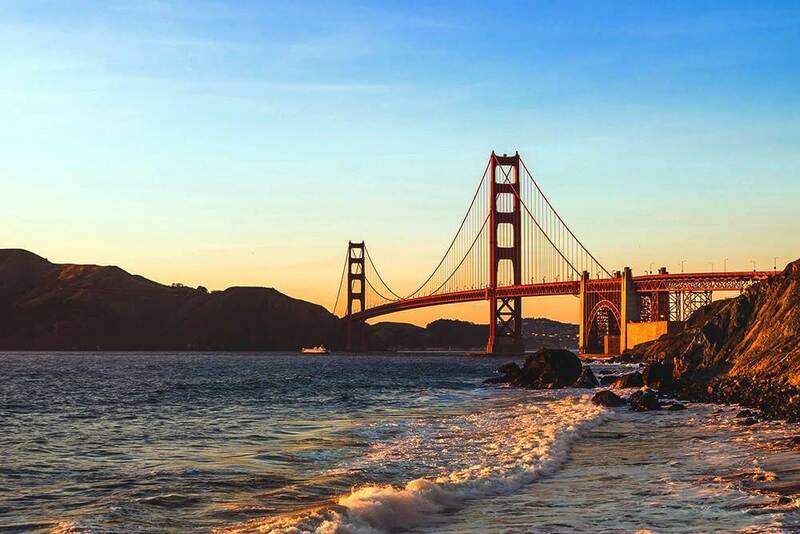 Enjoy scenic views of Alcatraz, San Francisco Bay and the Pacific Ocean while walking along the Golden Gate Bridge. Perhaps you’ll even get lucky and see some sea lions and other wildlife swimming near the bridge! End your journey with a short hike up to Battery Spencer; a park perched in the hills of the Golden Gate National Recreation Area. Time your trip just right to see the sun setting into the ocean over the bridge. With delicious chocolate, sea lion sightings and a submarine, the Fisherman’s Wharf offers plenty of activities for the kids to enjoy. Sample a variety of artisanal chocolate at Ghirardelli Square at the Original Chocolate Manufactory. View sea lions while walking along the boardwalk at Pier 39. Hop aboard the historic USS Pampanito, for a unique WWII vessel experience the kids won’t forget. Camp alongside the Atlantic Ocean at the San Francisco RV Resort. Just 15 miles south of the Golden Gate Bridge, this park is the perfect headquarters for your San Francisco trip! Enjoy gorgeous sunset views, a dip in the on-site pool, Wi-Fi and a playground. All the sites are paved and you decide your pull-in option, for your most comfortable stay. One of the world’s tallest waterfalls, Yosemite Falls You can choose to view the falls from the trail below or hike up to the top on an all-day hike. The easy, Lower Yosemite Fall Trail is highly recommended for visitors of all ages. Along the hike, learn about the park and the falls at exhibits. The best way to access the falls is via a shuttle. Shuttles consistently run from open to close in the park. Choose shuttle stop 6 for Yosemite Falls. With lovely views of the Yosemite Valley, Glacier Point allows visitors to see several of the parks most famous attractions: Half Dome, Yosemite Falls, Vernal Fall and Nevada Fall. Hop aboard the Glacier Point Bus tour for a ride to the summit. From there hike down to the valley on a rewarding 4.7-mile hike that takes approximately 2 to 3 ½ hours. Many Yosemite Park visitors opt to take the bus tour one way and hike down to the valley, so you may make some new friends along the way! Located on the western edge of Yosemite National Park, Yosemite Pines RV Resort & Family Lodging is fun for the whole family. 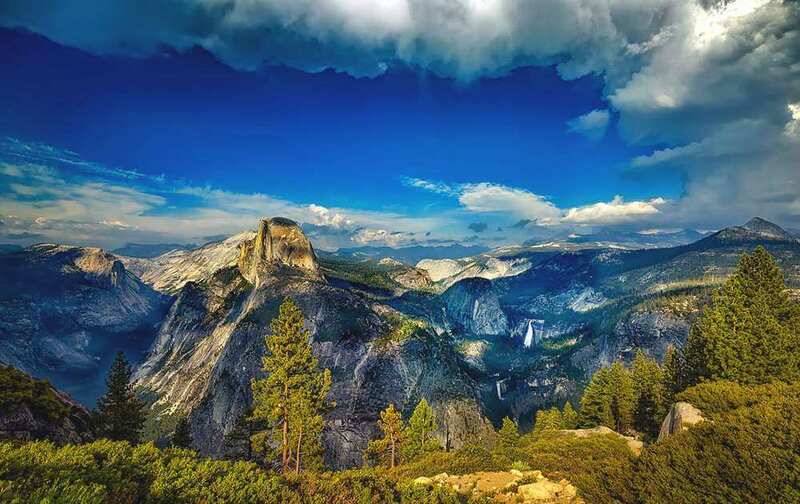 The park is just a 30-minute scenic drive from the west entrance of Yosemite. During your stay, enjoy the volleyball court, petting farm, bocce ball courts and swimming pool. Free Wi-Fi and pet accommodation is also available for visitors. Image courtesy of Shinya Suzuki. Licensed under Creative Commons 2.0. Take a self-guided tour along the Hollywood Walk of Fame, where stars are born. Approximately 2,500 stars are located on the walk, which includes 15 blocks on Hollywood Boulevard and 3 blocks on Vine Street. But there’s no need to do the whole walk. If you have a favorite ‘star’ in mind, start there and work your way along. Maybe you’ll even get lucky and see the induction of a new star on the Walk of Fame. Feel like you’re seeing stars? Then you’ve come to the right place. Griffith Observatory, featured recently in the film La La Land, is the perfect destination take in some astronomy. Stars aren’t the only things you can see at the observatory. 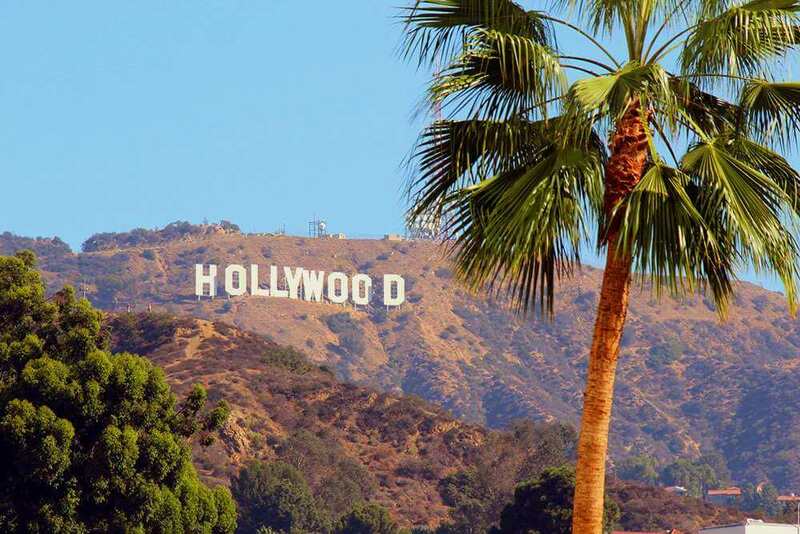 Enjoy beautiful views of Los Angeles valley and the Hollywood Sign. Image courtesy of Tony Hisgett. Licensed under Creative Commons 2.0. 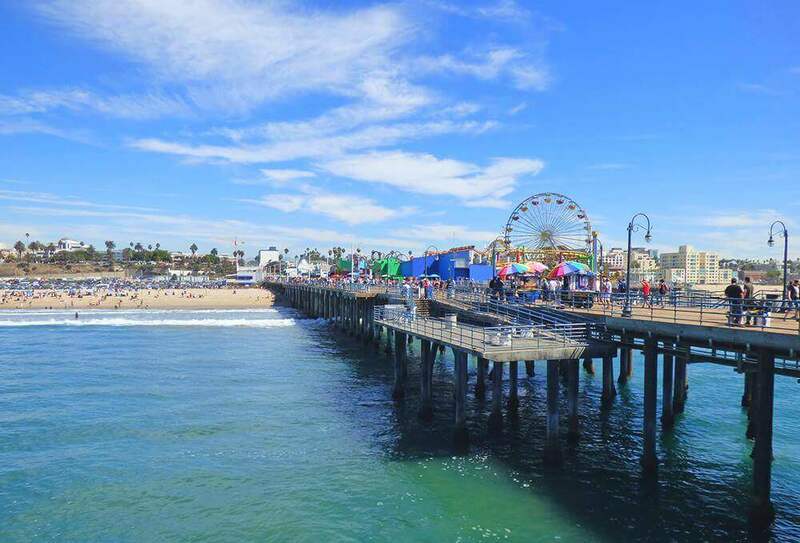 After a day spent enjoying the sun at Santa Monica State Beach, head over to Santa Monica Pier. Enjoy a tasty meal of carnival fare, if you choose, and grab a cone of ice cream as you walk along the 2000 ft. pier. Afterward, treat yourself to a couple of carnival rides or two. Insider tip: on Saturdays and Sundays, the pier offers a free historical walking tour. Tour the city the eco-friendly: on two wheels. The Santa Monica Bike Center has a variety of bike options to choose from, including electric and tandem bikes. Take a guided tour or do one of the center’s suggested tours on your own. Either way, biking along the Santa Monica beach path is a great way to further view all that city has to offer. Why stay in two separate parks, when you can stay in one for two destinations? Stay at the Dockweiler RV Park for access to both Los Angeles and Santa Monica. Dockweiler is actually L.A. County’s only RV campground located directly on the beach. Enjoy spectacular views of the Pacific Ocean, romantic sunsets, a cozy beachside fire and plenty of the fresh ocean breeze. The park offers full hook-ups and surf fishing lessons, if you’d like to try! Image courtesy of Christopher Michel. Licensed under Creative Commons 2.0. Great for nature enthusiasts, the 49 Palms Oasis Trail offers hikers great sights of Joshua Tree National Park. 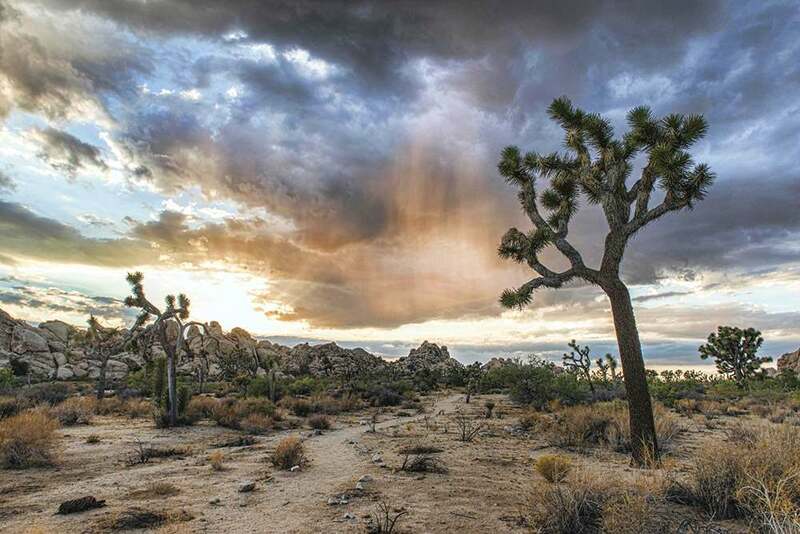 Discover the natural ecosystems of the park, including: Joshua Trees, shrubs, cacti and countless rare species. Enjoy wild flowers in the spring! To access the 3-mile trail, drive down Canyon Road-just west of the Oasis Visitor Center. Park at the Day Use Area and proceed to the trail until you reach the 49 Palms Oasis. See this map for more information. One of the best kept secrets of Joshua Tree National Park, Cottonwood Spring is located 7 miles from the south entrance to the park. Soak for a while and take in the natural hot springs, made centuries ago by volcano activity in the area. Don’t forget to bring your binoculars! Cottonwood Spring has some of the best birdwatching in the park! Revel in the stars and the beauty of the desert at Joshua Tree Lake RV and campground. Located just north of the Joshua Tree National Park, the campground is a short 14-mile journey from the park. Reservations are recommended for RVs with hookups. For non-hookups, the policy is: first come, first served with no reservations. Back-in and pull-through lots are available. A trip to Las Vegas isn’t complete without seeing a showing of the Bellagio Fountains. Each performance is unique, featuring a romantic trio of water, music and light. Find a seat or walk around, it’s your choice. View the Bellagio website for show times. Depending on the day, there’s typically a showing every 15 minutes to ½ hour from 3-12pm on the weekdays. Weekend hours are similar, but vary a bit. Get up close and personal with some of the most majestic animals to walk and swim the earth at Siegfried & Roy’s Secret Garden and Dolphin Habitat. The garden and animal habitat houses a collection of bottlenose dolphins, white tigers, white lions and leopards. Who knows, you may even meet the famous magicians yourself-as they’ve been known to greet guests from time to time. A striking contrast to the Las Vegas Strip, Thousand Trails Las Vegas RV Park is a serene destination surrounded by desert wilderness. Located just six miles south of downtown Las Vegas, Thousand Trails offers not only peaceful surroundings but also convenience for guests. Some of the park’s amenities include: a dog park, swimming pool, horseshoe pits, cable and Wi-Fi. 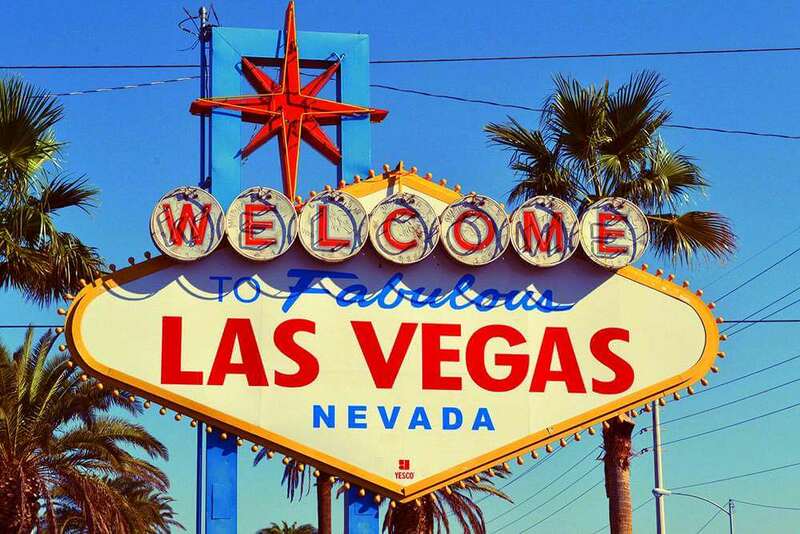 You’ll enjoy returning to the park after a day in the busy city of Las Vegas. Image courtesy of Anna Fox. Licensed under Creative Commons 2.0. 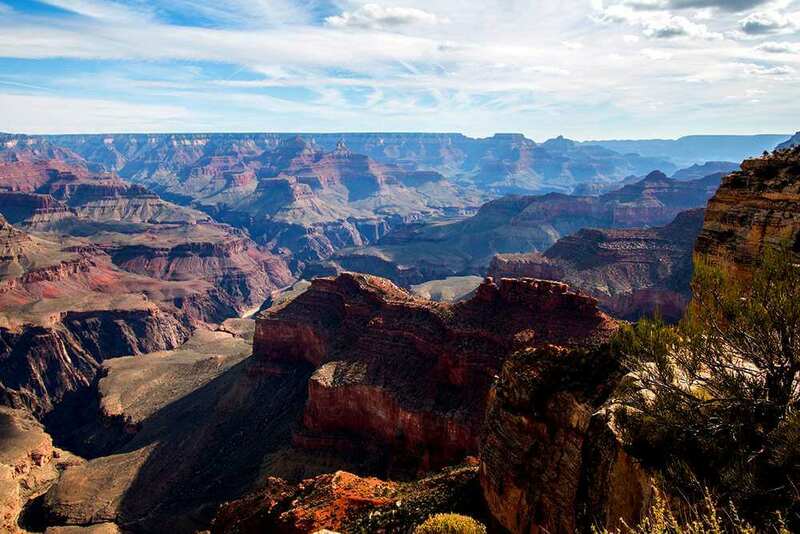 Pack a picnic lunch and grab your hiking boots, you’re about to take an adventure through one of America’s greatest wonders-the Grand Canyon! The South Rim trail offers plenty of idyllic views of the historic canyon, but can be hot so be sure to pack your water. Bring a camera to capture the best sights! The trail is 12 miles long, but it can be tailored to fit your hiking needs. Shuttles stop along the trail at different points, offering a way back to the entrance if needed. The longest stretch between shuttle stops is 3 miles, but the majority of stops are offered every 1 to 1 ½ miles. View this handout from the National Park Service for more information. Have you ever wondered what it’s like to walk on the sky? Soar like an eagle? Well now you can experience both at the Grand Canyon Skywalk. This splurge is well worth it on the last destination of your west coast trip. You’ll be able to see deep into the canyon on the clear floor of the skywalk. Weather may affect availability, so be sure to call ahead in advance. Conveniently located close to the South Rim of Grand Canyon National Park, Trailer Village RV Park provides sweeping desert views for campers. The park is open all year round and features full hookup and paved pull-through sites for campers. Note: wood fires aren’t allowed for wildlife preservation purposes-only charcoal fires are allowed.